Abstract: The 1st sedimentary complex of the Triassic to Upper Jurassic (up to Oxfordian) was deposited after long continental period of the uppermost Permian to lowermost Triassic (=about 8 Myr). This large sedimentary complex is divided by three hiatuses; two of them short only situated in the Upper Triassic sediments and by one long, corresponding to the Upper Jurassic–Barremian. After sedimentation of the continental Aptian to Albian strata of the Kiklah Formation, a new large Cenomanian to Eocene shallow marine sedimentary cycle with many gypsum lagoonal passages was deposited. They are represented by the Qasr Tigrinnah Member (Upper Turonian–Coniacian) and the Thala Member (Santonian to Upper Campanian). On the top of the Thala Member a hardground formed under arid conditions of sedimentation. 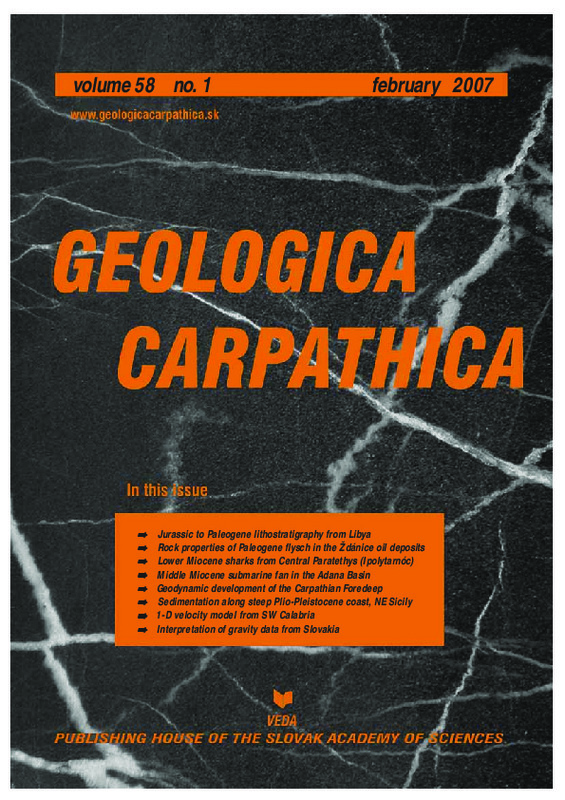 The Upper Campanian/Maastrichtian Al Gharbiyah Formation was deposited in warm but humid conditions confirmed by the Fe-oxides and glauconitic levels. The Al Gharbiyah Formation with three neritic Members: the Bi’r Bu al Ghurab, the Lawdh Allaq (alternating with the Bi’r Az Zamilah Pelagic Member) and the Tar Member is represented and situated below the Upper Paleocene Tabaqah Formation, a new name. The boundary between the Maastrichtian and Danian is defined by last occurrence of Omphalocyclus macroporus Lamarck and by appearance of the Postrugoglobigerina daubjergensis (Broennimann) and Eoglobigerina danica (Bang). The Shurfah Formation is represented at its base by lagoonal sediments, higher up by pelagic chalky limestones and by the neritic Ammur Limestones at the top. The Kheir Formation and Gir Formation of the Ypresian and the Gedari Formation of the Lutetian are proved by planktonic foraminifers. Abstract: A petrophysical investigation was carried out on the hydrocarbon deposit, which occurs in East Moravia near the village Zdanice at the depth of 1 km. The objective of investigations was to find out whether there is a significant difference in the radioactivity of the rock and in other studied parameters between rocks above the deposit and rocks from a distance of 2–3 km. Shallow boreholes were drilled above the deposit and in its vicinity to get rock samples (claystones and siltstones — CLS and sandstones — SNS). Petrophysical parameters — densities, porosity, magnetic susceptibility, radioactivity, and contents of carbon and sulphur were determined and statistically evaluated. Statistical tests of difference between petrophysical parameters of rocks over the oil deposit and outside the oil deposit show a low indicative power of separate petrophysical parameters, while their comprehensive application may enhance their petroleum indicative value. Abstract: Previously described selachian remains from the Lower Miocene sandstone at Ipolytarnóc (north-eastern Hungary) have been revised, together with recently collected material from the same locality. The fauna is diverse and includes 19 genera with 16 certain species, from which 5 newly reported from this locality (Squalus, Centrophorus, Isistius, Mitsukurina, Scyliorhinidae). The earlier described four species that originated from the area — Notidanus paucidens Koch, 1903, Notidanus diffusidens Koch, 1904, Lamna tarnoczensis Koch, 1903, Oxyrhina neogradensis Koch, 1903 — have been redetermined as Notorynchus primigenius, Carcharias acutissima and Parotodus benedeni. The Chondrichthyes fauna represents a warm-temperate, subtropical climate with wide habitation range that was typical in the Alpine Foreland Basin and the Central Paratethys during the Lower Miocene. Abstract: The turbiditic Cingöz Formation of the Karaisah-Çatalan-Eğner region, Adana Basin, southern Turkey was studied in detail in two sections based on planktonic foraminifers, calcareous nannofossils and trace fossils. The Middle Miocene (Langhian–Serravalian) age of the sediments is supported by the Praeorbulina glomerosa curva and Orbulina suturalis planktonic foraminiferal Zones and by standard nannoplankton Zones NN5 Sphenolithus heteromorphus and NN6 Discoaster exilis. Moreover, 24 ichnotaxa were identified and attributed to the Skolithos-Cruziana, mixed (Skolithos-Cruziana and Nereites), and Nereites ichnofacies. Fossil assemblages indicate eutrophic and oligotrophic conditions. In the Langhian, the distribution and percentage abundances of temperature sensitive planktonic taxa including Globigerina falconensis reflect temperate to cold surface waters in the depositional area of the western and eastern fans of Cingöz Formation. In Serravalian, higher numbers of warm-water prefering taxa indicate the rise in temperature in the western fan. Abstract: Five 3rd-order depositional sequences were recognized within Neogene infill of the Carpathian Foredeep. Individual sequences are characterized by the diverse shape and extent of the basin, by characteristic depositional architecture and lithofacies. Their deposition was controled by the principal ruling factors, namely eustasy, tectonics, sediment supply, and basement morphology. 4th-order depositional sequences (transgressive-regressive cycles) are also identified within the 3rd-order depositional sequences. Depositional sequences are related to three distinct stages of the geodynamic history of the basin. The pre- (“main”) collisional stage (Egerian/Eggenburgian) is represented by sequence I and was ruled by eustasy, sediment-supply rate and basement relief. The collisional stage (Eggenburgian–Late Karpatian) is represented by three sequences. Sequence II (Eggenburgian–Early Karpatian) reflects the initiation of thrusting due to loading of the West Carpathian accretionary wedge. This process was mainly responsible for creation of accommodation space, while the other factors were supplementary. Sequence III (Karpatian) was ruled mainly by interactions between tectonic/flexural subsidence and isostatic rebound associated with the forebulge migration toward the foreland and thrust front. Sequence IV (Late Karpatian) is the upper part of the clastic wedge and reflects the main collision and rapid subsidence in the foreland basin. The depositional architecture was dominantly driven by tectonic processes. The post- (“main”) collisional stage (Early Badenian) is identical with sequence V, which was ruled both by eustasy and tectonics. Accommodation space (incised valley?) developed in the internal parts of the basin. Abstract: A 160 m thick Pliocene-Pleistocene sedimentary succession, cropping out in NE Sicily (Rometta Succession), was subdivided into three unconformity-bounded units, overlying deformed bedrock: (i) a Middle Pliocene sandy-marly R1 unit; (ii) an Upper Pliocene-Lower Pleistocene biocalcarenitic R2 unit; (iii) a Middle Pleistocene mudstone R3 unit. The R2 unit is composed of at least three sub-units, bounded by truncation surfaces, and showing aggradational patterns of strata. Each of these sub-units records a sudden seaward-shifting of the facies tract. A stratigraphic gap of ~870 kyr at the R1/R2 boundary, marks an abrupt change from offshore transition to shoreface environments. A second gap of ~260 kyr at the R2/R3 boundary corresponds to a sudden deepening of the environments, from shoreface to fully offshore. The Rometta units represent three incomplete, tectonically-enhanced depositional sequences. The R1 unit is a HST of a lower sequence, marked at the top by a slightly angular unconformity. The R2 unit is a HST of a younger depositional sequence, aggrading above a ravinement surface. During these relative sea level still-stands, the local tectonic uplift combined with the high-frequency eustatic oscillations, produced three forward-stepping sets of minor sequences within the R2 HST, simulating the typical FSST stratigraphic arrangement. The top of the R2 is bounded by an erosive surface, representing the transgressive surface of the subsequent R3 depositional sequence. The R3 unit is a late TST+HST of a Pliocene-Pleistocene sequence, the LST of which probably occurs basinward. The foresetted R2 biocalcarenites are unimodal in their paleocurrents. This feature resulted from shore-directed wind stress, applied to the water surface and reflected by a steep paleocoast, generating basinward-directed bottom currents. Abstract: We computed a 1-D velocity model in the Gioia Tauro Basin area (southwestern Calabria, Italy) by inverting P-wave arrival times recorded by local seismic network consisting of eleven stations. For this purpose we used a data set of 207 local earthquakes which were located with a minimum of 7 arrivals, a travel time residual (rms) ≤0.3 s and an azimuthal gap ≤180º. This “Minimum 1-D velocity model” is complemented by station corrections which are influenced by near-surface velocity heterogeneity. Using the new P-wave velocity model and the program HYPOELLIPSE, we relocated the 207 selected events. Tests were carried out to verify the robustness of inversion results in order to corroborate the conclusions drawn from our findings. The comparison between previous and present earthquake locations has shown a significant improvement. The obtained “Minimum 1-D velocity model” may strongly help in the future routine earthquake location in the area. Abstract: This paper deals with the proper definition and correct compilation of the Bouguer gravity anomaly that differs from the standard definition repeatedly advocated in the geophysical literature. The difference between the new “correct” definition of the Bouguer anomaly and its “standard” definition has become known in geophysics as the “geophysical indirect effect”. Here we investigate the magnitude and variation of the geophysical indirect effect as a systematic error in gravity data inversion or interpretation in Slovakia. It is found that in Slovakia this effect is of the order of 3 mGal with a spatial variability of about 0.5 mGal over some 100 km. The impact of the geophysical indirect effect on the determination of the depth of a density interface is also estimated. In Slovakia, the impact of this systematic error is of the order of about 300 meters for a density contrast of 300 kg/m3.